Some good points. Klaus is right about the things he wrote, but I really like everything in the foreground. Sometimes there are artificial looking patterns in reality, so this isn't bothering me. But I agree about the pyramids. I don't know, if it's just the fact, that we aren't used to the look of more or less newly built ones, or if the edges are too sharp and maybe too perfectly straight. It starts to look very good. I think the reddish atmosphere conveys a sense of doom. 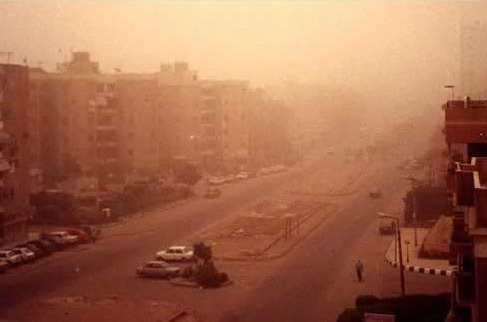 Maybe more dust in the sky because sometimes there is a lot of it in Egypt. The pyramids look a bit strange at first glance because they are almost the same color as the sky. Just read Klaus's comments and generally agree with them. I'm not satisfied with the environment yet. I wanted an orange morning, thick dusty sky, but then I didn't like how it washed out all the objects with orange. I just have to do more testing. I'm making the far road, less of a road and more of a beaten path. Cow or cows will be generally in one place. My houses look older than Ulco's here, he's using a previous non-material'd version I guess. Trees I like. All of the dead locusts on the ground I like. Looking disastrous, but shouldn't there be some cracking in the buildings if the trees are that distraught? And Egyptians were probably still living in them. Our Israelite caravans will be just passing through this area.